ONEKAMA — Thomas Long Koon of Onekama has earned the highest advancement award the Boy Scouts of America offers to Scouts, the Eagle Scout Award. Koon is a member of Troop 63 chartered by the Onekama Lions and led by Scout master Bruce Brandt. He has earned 28 merit badges during his time in Scouting. He also received the Arrow of Light Award, God and Country Award, and is a member of Order of the Arrow. During his time in Scouting Koon has served in numerous troop leadership positions. He also has served in the position den chief for younger Scouts. Koon’s service project for his Eagle Scout was done at Northpoint Park in Onekama. Northpoint Park is a 60-acre park located off Portage Point Road in Onekama. It has over two miles of walking paths, and over 50 labeled plant species. The project was completed under the guidance of the Onekama Township Parks and Recreation Committee. Donations came from Seng Dock & Trucking, Grand Rental, Robert Bennett and Pleasanton Valley Greenhouse. It was a project that included 200 hours of volunteer time. Koon completed several jobs of the project on his own including the clearing and chipping of brush, removal of invasive plants, planting shrubs, laying stones and wood chips, and installing fencing. 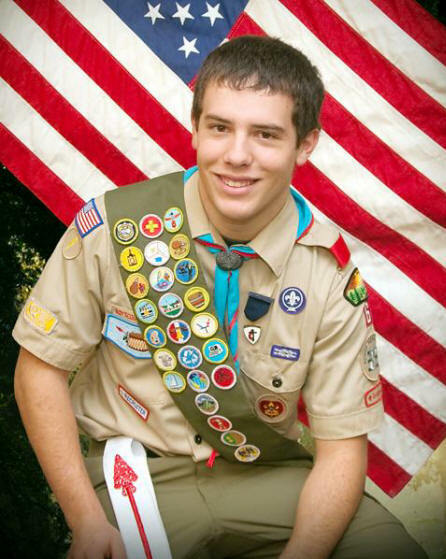 The Eagle Scout is a senior at Onekama High School. He is a member of the National Honor Society, 4-H, football, basketball and baseball teams at school. He is the son of Tom and Sally Koon, grandson of Betty and Joe Koon, June Long, and John and Elaine Long all of the Manistee area. Koon remains active in his Boy Scout troop and hopes to study engineering in college. The Scout also expressed his appreciation to all the adults, teachers, mentors and fellow Scouts that have helped him in many ways over the years.